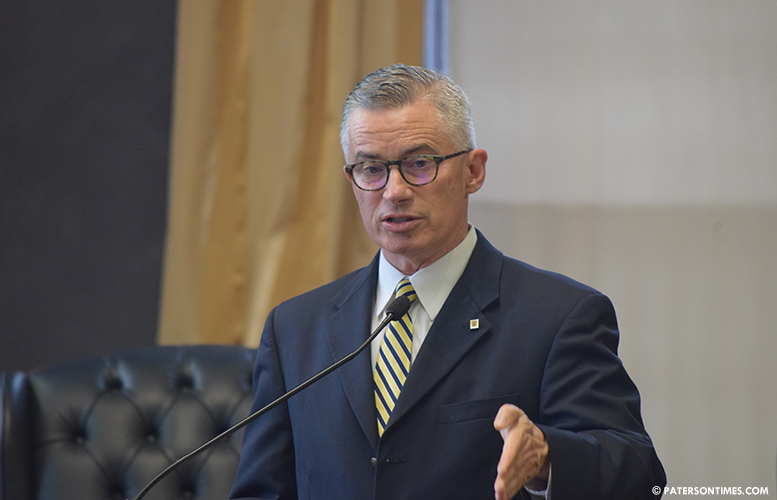 Former governor James McGreevey launched a program on Monday morning that will focus on getting disadvantaged Passaic County residents — focused on Patersonians — trained for jobs in the booming building and construction trades. The NJBuild program run by the New Jersey Reentry Corporation will begin its first three-month pre-apprenticeship training session in early September. 50 slots are available for Passaic County residents, said McGreevey. His team setup tables at City Hall to sign up interested residents for the program. “It’s about employment, employment, and employment. The best social welfare program in the world is a job,” said McGreevey, chairman of the New Jersey Reentry Corporation, which runs the reentry program on Montgomery Street. McGreevey said trainees will be able to secure union jobs that offer as much as $60 per hour. “The people of Paterson deserve decent, well-paying jobs with good benefits, and this pre-apprenticeship training program is a great pathway to that future,” said mayor Andre Sayegh. While running for mayor, Sayegh promised to put residents to work through job training programs. Sayegh was joined by three council members at City Hall in announcing the new program. Council president Maritza Davila recalled campaigning in the impoverished Riverview neighborhood. She was approached by a man who was desperate for a job. “I just came out. I don’t have a job. I can’t find a place to live,” recalled Davila. McGreevey’s program will serve the economically disadvantaged, minorities, and women. It will also increase opportunities for those with a history of addiction and incarceration. Matt Doherty, a former firefighter from Atlantic City, who shared his struggle with drug addiction, signed up for the program. He is looking for a fresh start as an electrician or carpenter, he said. Doherty was prescribed OxyContin for a knee injury that set him up for heroin and cocaine. He found himself addicted to illegal drugs. Police caught him with drugs and arrested him. He later enrolled at the Straight and Narrow drug addiction recovery program. “It’s an wonderful opportunity,” he said after signing up for the program. The New Jersey Reentry Corporation received $843,000 from the New Jersey Department of Labor and Workforce Development for the program. Funds will allow the program to train 200 people in seven countries: Hudson, Essex, Passaic, Middlesex, Monmouth, Middlesex, and Somerset. McGreevey said the program started in Jersey City and Newark last month. The program offers day and evening classes. First session starts on Sept. 4 and ends on Dec. 21, 2018. A second session begins on Jan. 7, 2019.